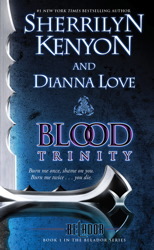 Check out the amazing trilogy from Sherrilyn Kenyon and Diana Love on sale for a limited time! They’re only on sale until July 28, so be sure to follow the links at the bottom to pick up your copy today! You’ll also get a sneak at RISE OF THE GRYPHON if you hurry! Supernatural warriors bound by an extraordinary code of honor face an ultimate test of loyalty in the exciting new paranormal thriller from New York Times bestselling authors Sherrilyn Kenyon and Dianna Love.